My mother in law invited some friends over for dinner last week. I made this as a starter for our Penang Laksa dinner. 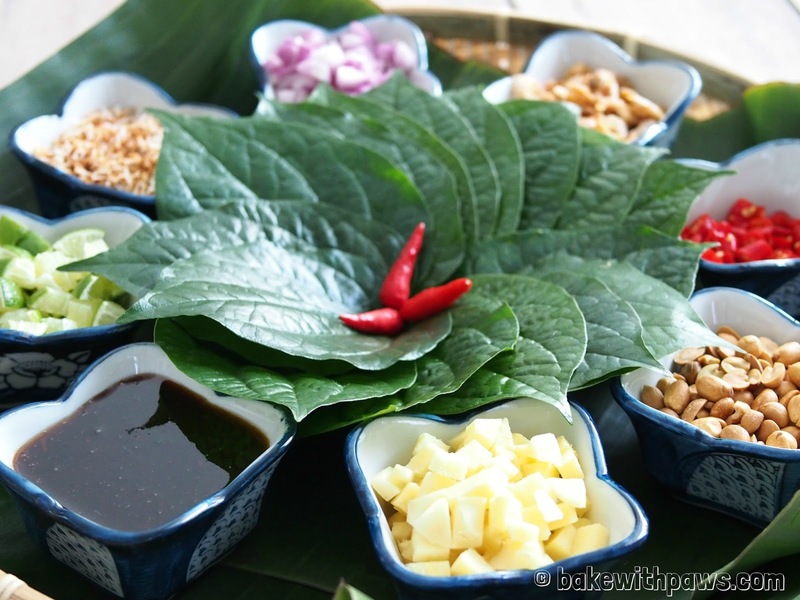 I was happy that I made the right choice as one of our friends happen to love Miang Kham. I have simplified the ingredients and method of preparing the sauce. This is my recipe. I hope you will enjoy it as much as we did! Inspired by Rama V Cookbook. 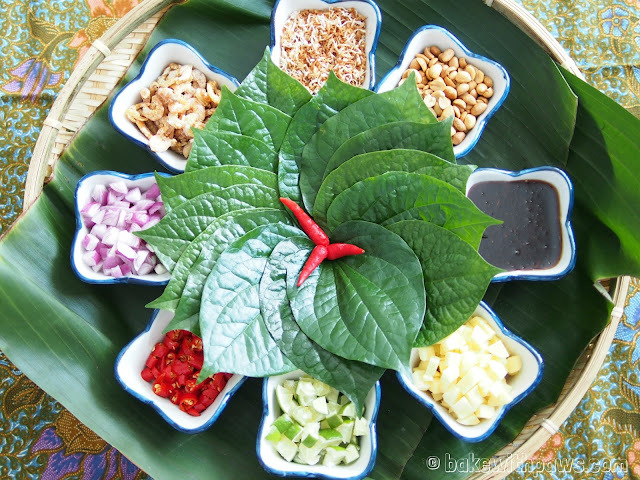 30 pcs daun kadok (wild pepper leaves), rinsed and dried. Soak tamarind in 200ml of water until softened. Mash it with your finger and strain the juice. 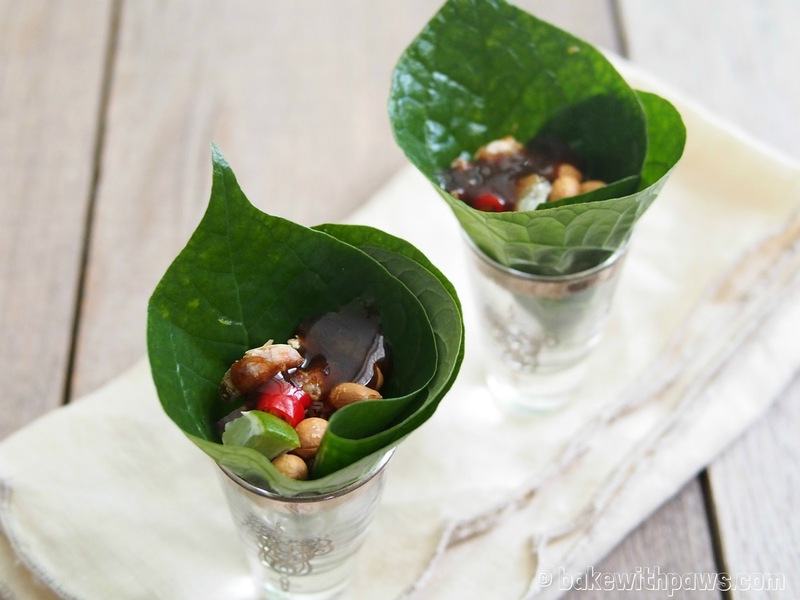 In a small sauce pan, add tamarind juice with the rest of sauce ingredients. Bring to boil over medium heat. Then turn the heat to low and simmer the sauce until become thicker. Remove the lemongrass and set aside to let it cool. Toast peanuts and dried shrimp in air fryer separately. Set aside. In a wok, fry the grated coconut until brown and fragrant, stir constantly. Set aside. Dice the ginger, shallots, lime and bird’s-eye chillies into small cube separately. Serve all the ingredients in a small bowl individually. Fold a leave into a cone. Put a bit of each component in the leave and top with small spoonful of sauce. Wrap it and eat the whole thing in one bite.